It may be summer in the desert, but ask any real estate agent what’s really making them feeling hot, hot, hot and they’ll tell you it’s the sizzling housing market in Las Vegas, not the weather. It’s no secret the Golden State has long been a target market for Southern Nevada real estate given California’s high taxes, high cost of living, home prices and traffic congestion. Today, more and more Californians are coming to Las Vegas in droves for an improved quality of life. And in light of Nevada’s still relatively affordable housing prices, moderate year-round climate and vibrant scene, that is even truer today. According to a recent Redfin.com report, Las Vegas is a top destination for home searchers from California, and the largest share come from high-priced coastal cities, including Los Angeles, among others. At communities like the ones that comprise DK Las Vegas’ portfolio, which includes The Ogden and Juhl in downtown Las Vegas and One Las Vegas at the south end of Las Vegas Boulevard, condos are being purchased and claimed faster than a miner can declare, “gold!” No wonder One Las Vegas is the city’s fastest-selling condo community! According to a recently released report by realtor.com®, there is tangible data proving Las Vegas to be the nation’s number one market for real estate this year, and that it’s expected to grow about 8.7 percent – nearly two percent more than the rest of the top 100 markets. The Standard & Poor’s CoreLogic Case-Shiller national home price index released last fall also revealed Las Vegas home prices rose 6.2 percent in September from a year earlier, the largest gain since June 2014 – more evidence that Las Vegas homes are in demand. 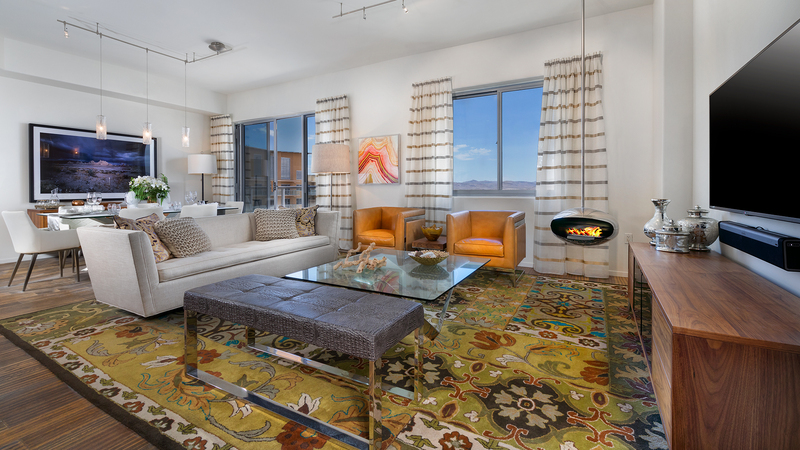 With DK Las Vegas homes starting in the low $200,000s, pricing remains highly competitive and buyers are encouraged to explore the community now, while homes are still available and interest rates remain relatively low. “People are back to work, they’re spending money, the economy here is fantastic, the nightlife is great, and everywhere you go in Southern Nevada, there is development happening,” said Chris Bishop, president of the Greater Las Vegas Association of Realtors (GLVAR) in a recent interview. He pointed out that homes are flying off the market, and why it’s a great time to buy a home here. And while the rising demand for homes in the valley is good news for real estate, it means it’s time for potential homebuyers to put on their game faces. A more recent report from Home Builders Research revealed there were 704 new home recorded sales in January, which is the most home closings in a single month in the last decade. GLVAR’s recent report also revealed that condos and townhome prices are rising at a much faster clip than single-family homes, further proof the idea of living in a condominium community is becoming more appealing to those looking to buy their next home. According to GLVAR, “in May, 91.4 percent of all existing local condos and townhomes sold within 60 days,” a near four percent increase compared to this time last year. The rise in townhome and condo living represents a shift in thinking about home ownership as millennials and empty nesters, alike, are looking to right-size their homes to accommodate a more experiential lifestyle.